Viceroy Hotels & Resorts has put a fearless, provocative spin on the modern hotel experience with the opening of Hotel Emblem. 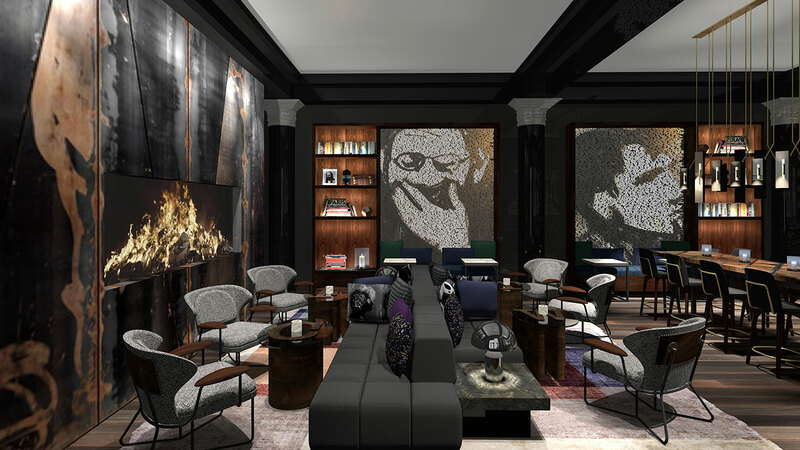 The boutique property, located in San Francisco where Nob Hill meets Union Square, is inspired by the Beat Generation – San Francisco’s most celebrated literary and cultural movement of the 20th century that inspired millions to live boldly and uncensored. Hotel Emblem entices travellers to leave the status quo behind with eclectic guestrooms, stimulating events, rich cultural and wellness experiences, and the authentic hospitality that Viceroy guests are accustomed to. Hotel Emblem is owned by DiamondRock Hospitality Company and is a member of The Viceroy Urban Retreats. Ideally located in the Theater District, in the heart of the city, the 96-room hotel is a creative stage designed to inspire guests to think freely and stand out from the crowd. Upon entry, guests are enveloped in Hotel Emblem’s crisp and woody signature scent of fire, cedarwood, moss, birchwood and burning paper. A warm welcome comes from staff outfitted in custom uniforms by contemporary global fashion label AllSaints, a brand that mirrors Hotel Emblem’s ethos of independent spirit and creative attitude. Throughout the lobby, Bay Area design firm Wilson Ishihara sought to ignite a vibe of unabridged expression. 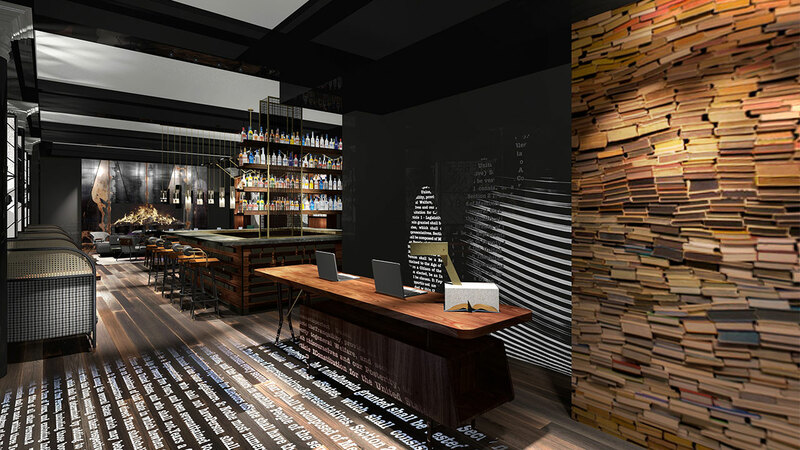 A wood front desk mimics a writer’s desk, and guests checking in are greeted with a custom-crafted welcome cocktail from Obscenity Bar & Lounge. To the right, a Writer’s Alcove is nestled within a full-height book wall, offering a literary oasis in which guests can write a love letter, poem or postcard. Cultural programming and thoughtful amenities are seamlessly infused into the experience at Hotel Emblem. Starting in February, guests can enjoy Meditation Hour every Saturday in The Den, courtesy of San Francisco-based Anchor Meditation. The Book Butler program features a cart brimming with Beat Generation literature from the famed local independent City Lights Bookstore, including iconic titles Howl and Other Poems by Allen Ginsberg, On The Road by Jack Kerouac, San Francisco Poems by Lawrence Ferlinghetti, and The First Third by Neal Cassady. Guests are invited to summon the cart via room service and check out the books during their stay or enjoy their in-room library curated by HarperOne, the San Francisco-based imprint of HarperCollins. In addition, guests are encouraged to raise their voice during live entertainment like poetry slams and jazz performances, programmed with local artists. A dedicated Underground Concierge can guide guests to the obscure and uncut parts of the city. Complimentary bike rentals for touring San Francisco are available, as is 24-hour room service. Opening in early February, Obscenity Bar & Lounge is a destination for spontaneous dialogue, hand-crafted cocktails and creative cuisine. Cosy vignettes, mid-century modern furniture and low glowing lights evoke drama tempered with comfort. Curved banquettes are tucked into one side of the room, behind which art represents burning books, a reference to society’s attempt to censor the Beat Generation. The open bar is a focal point, featuring plush seating and a menu of enticing cocktails. Drink highlights include Beet Generation, containing Bols Genever gin, organic beet juice, mint, simple syrup, lime and egg whites; The Kerouac, with mezcal, absinthe, cardamom bitters, agave, cucumber, mint and lime; and The Rum Diary, featuring white rum, cynar, cinnamon bitters, agave, pineapple and lime. Making its new home in the Hotel Emblem lobby, Bluestone Lane, also opening in early February, will be a hotspot for guests and locals alike, offering its beloved Australian-style coffee and healthy, seasonal fare. Their signature Avocado Smash will be a menu feature, along with Bluestone Lane’s entire range of premium coffee, tea, wellness lattes and healthy grab and go eats. 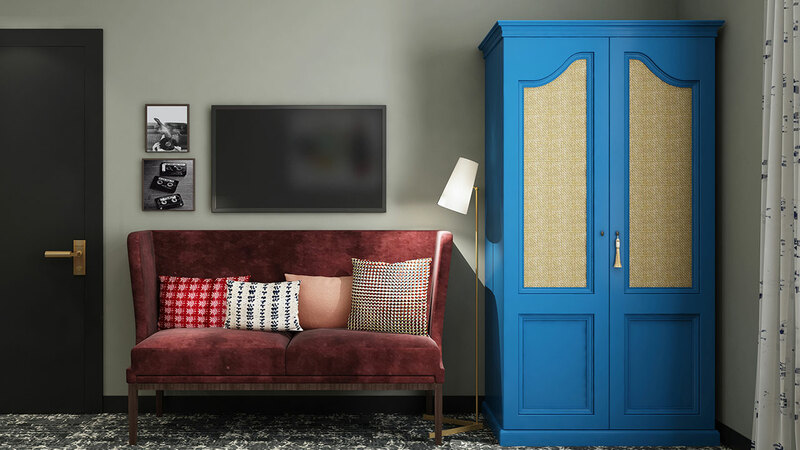 When guests retreat to their rooms, which are eclectic havens of bold colour and playful patterns, they’ll be inspired by poetry references that pay homage to the themes and personas of the Beats. 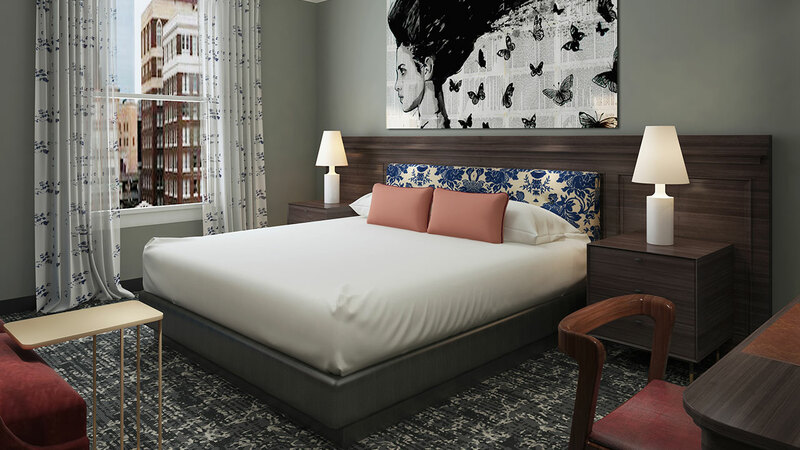 Designed by San Francisco-based Studio Hatch, the guestrooms accentuate the architectural bones of the historic building while featuring contemporary furnishings and a boho spirit. High ceilings and expansive windows invite relaxation. With modern art and European-inspired furniture, the feeling is residential and intimate. At each custom desk, a French bistro chair sits in front of an inspiration board that allows guests to interact with Beat references like photo booth strips and scribbled notes from celebrated writers. The bathrooms have big personality, too, with graphic tiled floors and black stone vanities complete with Natura Bisse and ROIL by Amanda George bath products. Each room offers luxurious amenities including a pillow-top bed with high thread count luxury linens, 55” HD Smart TV with streaming capabilities, bedside and desk charging ports, and a high-quality audio system with Bluetooth technology.